Well hello there, fellow denizens of the awesomepocalypse. Looking forward to firing up Sunset Overdriveon your Xbox One in the near future? As I noted in my review: this can be a really great game, but appreciating it requires some extra legwork. Here are some tips to help you get there. Sunset Overdrive's default punk rock dude character is kinda...dull, at least in comparison to the other, insane characters you can play as. The character creator is one of the best parts of this game, so putting in a few minutes at the outset will help you find your place in the colourful world of Sunset City. 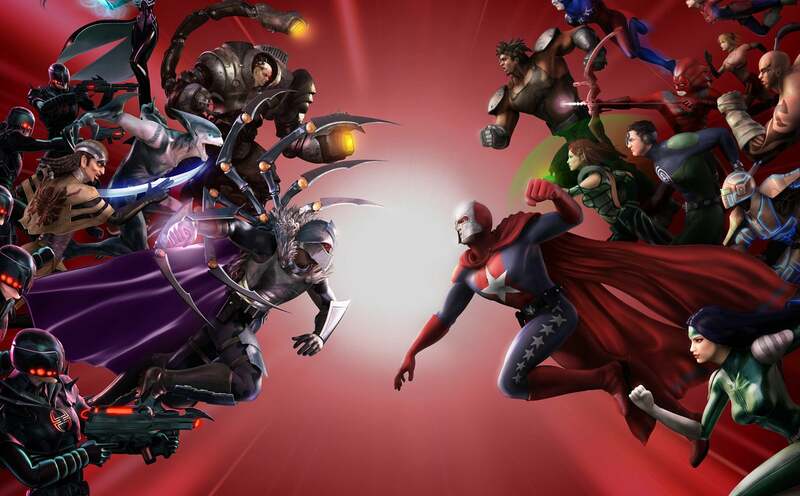 As you can tell from the picture of the beefcake above, the game has some very silly outfits to choose from. My personal favourites to play around with are the hair and eye colours — minor details on one level, but just the sort that help make the game feel truly personal. Think those all-white eyes you picked out are a little creepy? Or the bright pink fauxhawk is a bit much? Or maybe you'd just rather play as a hulk-sized man (again, see above) for a little bit instead of the svelte female character you originally selected? 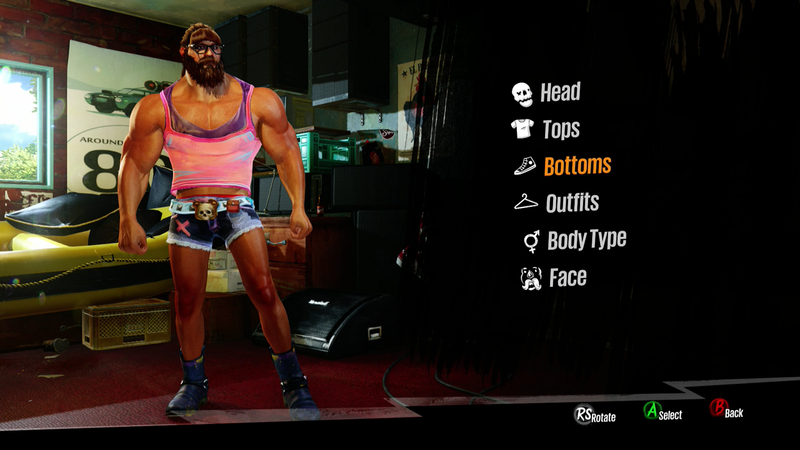 Sunset Overdrive lets you swap out every single thing you put into your character at any point in the game; all you have to do is approach the merchant Callista and start customising yourself. Like the weapons merchant Two Hat Jack, Callista has a ton of different locations peppered across the game's map. Unlike my colleague Nathan Grayson, I am not the kind of man who usually plays video games as a woman. 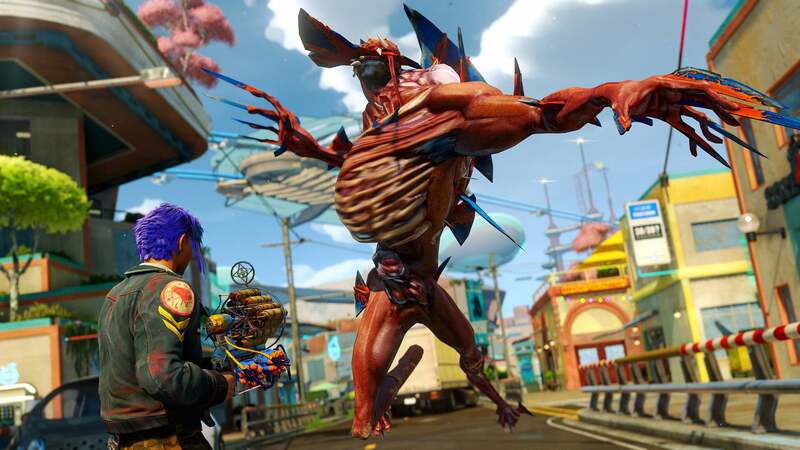 For whatever reason, I tried playing Sunset Overdrive with a female character and was pleasantly surprised by how much more fun it made the whole experience. This is more an aesthetic choice than anything: I just think the female voice actor is a lot better than the male one in the game, because she delivers the game's many intentionally humorous lines with a such charmingly silly tone. Obviously I'm not telling you that you should choose one gender over another. But since the game defaults to a dude, you might not realise there's another option available. 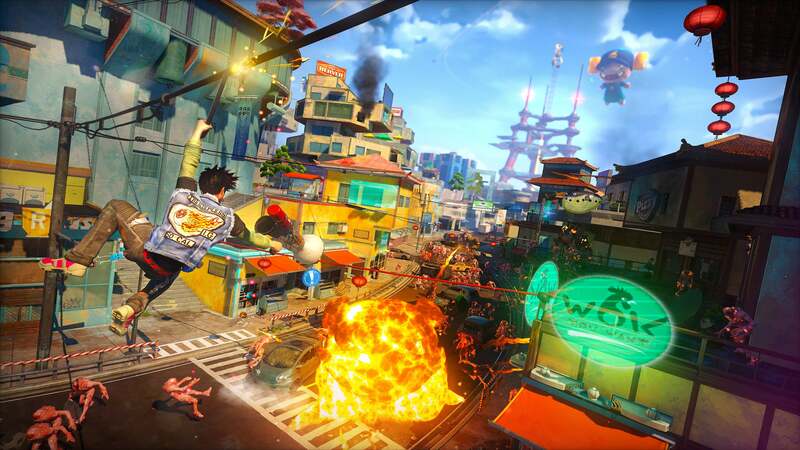 Kirk Hamilton and I have both found Sunset Overdrive's garage-rock-fuelled soundtrack incredibly bland and irritating. Like some other unseemly aspects of the game's tone and style, this unfortunately makes the whole experience of playing an otherwise fun game much less enjoyable than it should be. If you feel the same way, consider turning the game's music all the way down in the game's options menu and playing some of your own instead. As with your in-game gender preference, this is ultimately a matter of personal choice. 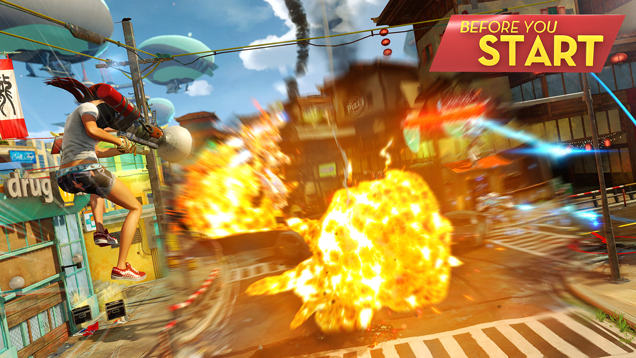 Sunset Overdrive isn't an RPG or anything, but it does have a levelling system in its colourful weaponry. Pretty much every time you use a weapon (to kill something, at least), you acquire experience for that particular boomstick. This isn't just an arbitrary bar to fill up, either: higher-level weapons are much more powerful. 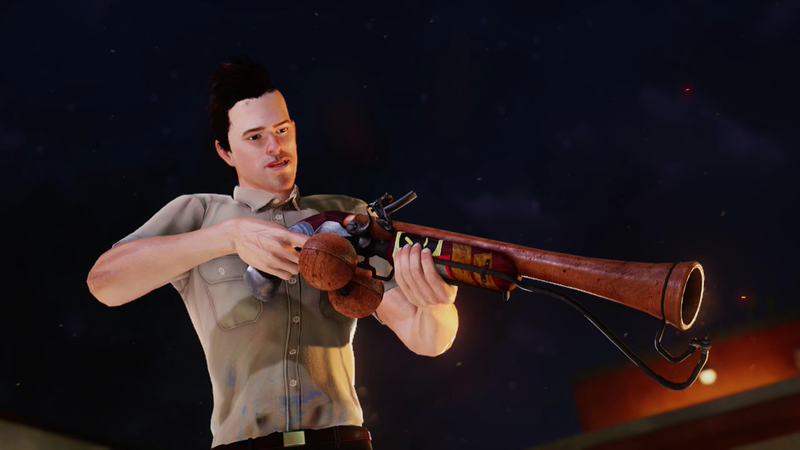 So if you're having trouble at any point in the game, try taking your favourite guns out for a joyride through Sunset City to level them up a bit. Given the wealth of weaponry in the game, its very easy to fall into a habit of leaning too heavily on one or two of your favourites. Resist this urge. Firefights in this game are so big and intense that you need to have more than a few high-level weapons at your disposal. You don't want to end up in a position where your shotgun and revolver are the only guns you've levelled up at all, and both are suddenly out of ammo. The game doesn't explain this until you get to one specific mission for some reason, but one of the core traversal abilities you have from the outset is a ninja-esque wall run. This is an essential tool for navigating Sunset City — especially during combat. Similar to grinding, tapping the top right shoulder button will speed you up. 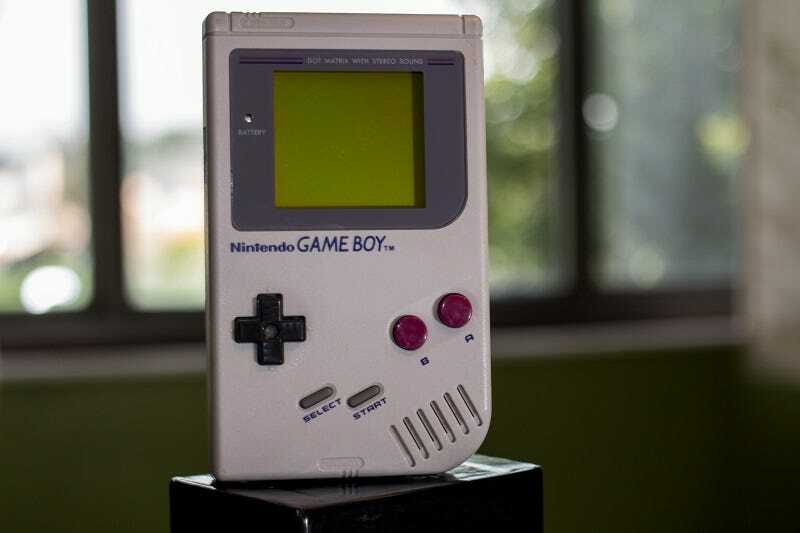 And if you press "x" again right before hitting a corner, you'll jump around the corner and keep running. If you're not in a rush, I'd recommend taking your time to dig into the sidequests (i.e., anything marked with a blue sticker on the map), because they're a lot of fun and help flesh out the world. That being said, there are a few different abilities and items you can only unlock when completing the main story missions — the ones marked with yellow stickers. There are three upgrades to your traversal abilities that make moving around a lot easier, and a special weapon you acquire once you complete the mission called "Awesomesmithing." After you get to that point, you can take your sweet time getting around to completing the main quest. A few readers sent me this video earlier in the week, suggesting like the creator does that it's a Destiny-type loot cave in Sunset Overdrive. I wouldn't go that far, because I don't believe the difficulty or levelling system is complex enough to even warrant a proper loot cave. But what the YouTuber has uncovered is a particular spot during a particular mission that makes it very easy to accrue lots of resources. 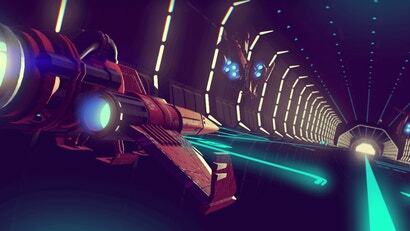 This scene takes place during a story mission called "Getting The Band Back Together." Basically, the situation is you have to bounce on a number of drums to kill lots of infected. You only complete the mission when you bounce on all the drums in a particular sequence, however. So if you just bounce on a single drum over and over again, the game will keep generating waves of OD for you to kill and thus gather resources from. Please chime in with your own recommendations and additions! I... I just wanna play it already!